How big space do you need when creating a home office? The average private office is about 10’ x 15’, but you don’t need that much space for a perfectly functional and great-looking home office. Whether you’ve got a whole room to work with or a sliver of another room, chances are you can create a functional, organized workspace without spending too much money (learn more about the average home office remodel). When you’re trying to carve out a smaller spot for working at home, start from the minimum and work your way out as you can. In the world of tiny offices, a cubicle is about as small as you can get without being hemmed in with no room to move. Cube dimensions are closer to 6’ x 6’ on the small side. If you’ve got a whole room, a 6-foot square, or something close to that size, you’ve got enough space for a home office. Here are some ideas for transforming that space into an office where you’ll love to work. Your desk doesn’t have to be born a desk. If you can find one that fits, that’s great. But if not, any sturdy, flat surface with legroom underneath will work. You can create a desk and storage with a few cabinets, and filing cabinets work even better. For your desk top, you can use a piece of 3/4-inch-thick plywood, with the top made from grade A so there are no knots, holes or plugs and grade B or C for the bottom. White melamine is also a good choice with matching, iron on tape to cover the raw edges and most Home Depot's will cut the melamine or plywood for you. A vintage panel door with a sheet of tempered glass or Plexiglass is clever and functional. 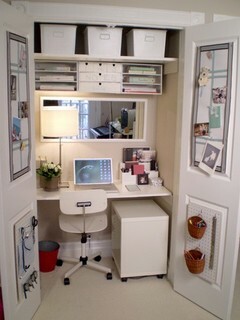 If space is very limited, you might want to create desk space inside a closet like the one shown here. Shelves or cupboards nearby keep supplies handy but out of the way. In a closet, some shelving is probably in place before you start your office project. Anything that keeps clutter off the desk, but still within reach, is a good thing. With today's electronics, you’ll want plenty of electrical outlets. Today's electrical codes call for more outlets because of our increased use of computers, printers and more. Unfortunately many older homes haven’t been upgraded since they were built. 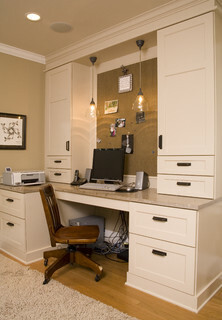 If your home office space doesn’t have an ample supply, consider calling an electrician to add more outlets. You can opt for surge-protector strips that have several outlets in one instead of more outlets, and they are generally safe. But for a safer and cleaner look, extra receptacles might be better and more energy efficiency with the right design for new outlets and wall switches. Lighting fits into the electrical category. With a flood of light, you won’t have struggle to work. Windows let in natural light in daylight hours, but ambient lighting brightens the room at night, and task lighting is important, day or night. You can achieve ambient lighting with recessed canister lights in the ceiling. Pendants or desk lamps add more focused task lighting to your workspace. 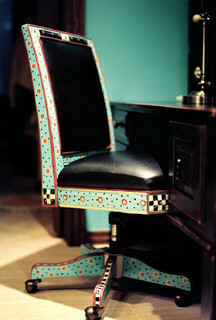 The right desk chair can make the difference between a good day’s work, and a grumpy day that drags on. Seating is arguably more important than your desk. And what’s great for one person might be miserable for another, so try chairs out before you buy. This artistic chair shows what a little ingenuity can do. It’s vintage, reupholstered, and this one's been given a one-of-a-kind paint job. As long as the chair fits the desk and is comfortable for you, whether it's vintage or modern, it’s perfect for your office. A home office can be a spare bedroom, a closet, a corner in your kitchen, or a narrow table along the back side of a sofa. Where there’s space, you can claim it. Storage might be as elaborate as a system of ceiling-to-floor cabinetry that wraps the room, or two humble filing cabinets that also hold up the desktop. As long as you’ve got a flat surface and a chair, plenty of outlets, and enough lighting to avoid eye strain, everything else is a matter of choice and inspiration. 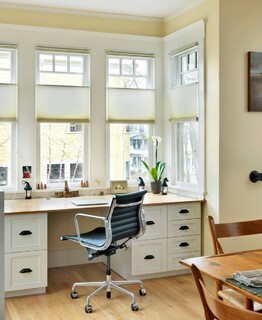 Have you converted a corner or whole room into a home office? What elements make a great office to you? Share your tips for everyone creating a home office. What's In Your Home Office?